A hidden truth. A desperate search. Keller Dover (Hugh Jackman) is facing a parent's worst nightmare: His young daughter and her friend are missing, and panic has set in for both families as hours turn to days. Heading the investigation, Detective Loki (Jake Gyllenhaal) arrests the only suspect - the driver of a dilapidated RV on which the girls had been playing - but a lack of evidence forces his release. As pressure mounts, Loki's team pursues multiple leads while a frantic Dover decides he has no choice but to take matters into his own hands. $20.817 million on 3260 screens. If their kids went missing, most parents believe they’d do anything to get them back. In 2013’s Prisoners, we examine just how far some parents will go to save their offspring. During a Thanksgiving celebration among two families, young friends Joy Birch (Kyla Drew Simmons) and Anna Dover (Erin Gerasimovich) suddenly disappear. This sends their parents into a tizzy, but they can’t locate the children. 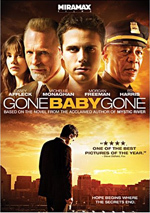 Led by Detective Loki (Jake Gyllenhaal), the local police come onto the case, and they take a mentally disabled young man named Alex Jones (Paul Dano) into custody as a possible suspect. However, they can’t find any clear connection between Alex and the disappearance of the children so they release him. This upsets the parents of the missing girls; in particular, Anna’s volatile father Keller (Hugh Jackman) goes ballistic. He feels certain that Alex knows where to find the kids and becomes determined to get the truth out of him by any means necessary. Now that I’ve seen it a second time – with altered expectations, of course – I can better view the film’s positives, but I still come away from the experience with a negative interpretation. Prisoners could’ve been a good movie but it falters too often. Without question, Prisoners fares best during its first half. Despite a reliance on religious imagery that seems forced, the film’s opening hour or so manages to draw us in reasonably well. It sets up the characters in a decent manner and creates an intriguing mystery along the way. So what goes wrong? Refer back to my self-quote for the short version, as it remains true. Prisoners starts to go off the rails right around the time Keller kidnaps Alex. Prior to that event, the movie provides reasonable character movement and an interesting narrative, but once Keller makes his choice, the story takes a notable turn for the worse. That’s because Prisoners goes from being a fairly good character-based drama to emphasizing inane thriller elements that don’t satisfy. Part of the problem stems from the movie’s overemphasis on Keller and Loki. The other characters head straight to the background, as those two become the focus – and are forced to interact in illogical ways. Honestly, Prisoners would’ve worked better if it’d concentrated more heavily on the family dynamic. Loki feels like a character who exists to make the movie a serial killer thriller, not because he needs to involve himself in the tale. Of course the flick needs some law enforcement presence, but other than to act as the driver of exposition, Loki doesn’t add much of interest. His presence takes a potentially compelling drama and turns it into standard cop fare. This ensures that the family members lose screen time and recede to the background. Prisoners wastes the talents of Howard, Davis and Bello, as they have little to do. They occasionally act as minor influences on Keller, but he seems to go his own way and lacks much connection to anyone else – other than Loki, that is, as their dynamic dominates. If Prisoners concentrated on the family and left the cops aside, it could’ve been good. If Prisoners focused on the investigation and became the Fincher movie it wants to be, it also could’ve succeeded. Unfortunately, its attempts to meld the two sides make it unsatisfying in both directions. Prisoners appears in an aspect ratio of approximately 1.85:1 on this Blu-ray Disc. The movie boasted a consistently positive presentation. For the most part, sharpness looked good. Interiors occasionally displayed light softness, but those instances remained modest. The majority of the movie seemed concise and well-defined. No issues with jagged edges or moiré effects appeared, and edge enhancement didn’t affect the movie. Print flaws also failed to mar the image. In terms of colors, Prisoners opted for a cool palette. It usually went with a sepia feel or an aqua tint at most; its tones stayed chilly and desaturated throughout the film. This meant the hues were subdued but fine given the stylistic choices. Blacks were dark and tight, while low-light shots demonstrated nice clarity. Overall, the film came across well. Given the character-based nature of the movie, we got a pretty restrained DTS-HD MA 5.1 soundtrack. The soundscape tended toward low-key environmental information, with little in the way of showy material on display. The flick’s frequent use of rain filled the speakers well, and some vehicle movement added life, but this was usually a subdued mix. Audio quality pleased. Speech consistently sounded distinctive and concise, without edginess or other issues. Music appeared full and dynamic, while effects came across as accurate and clear. Nothing about the mix dazzled, but it suited the material. In terms of extras, we get two featurettes. Every Moment Matters runs three minutes, five seconds and includes comments from director Denis Villeneuve, producers Kira Davis and Broderick Johnson, and actors Hugh Jackman and Jake Gyllenhaal. They discuss story, characters and cast. It’s nothing more than a glorified trailer, so don't expect to learn anything from it. Powerful Performances lasts nine minutes, 24 seconds and features Jackman, Gyllenhaal, Villeneuve, Johnson, Davis, and actors Viola Davis, Maria Bello, Terrence Howard, Paul Dano, and Melissa Leo. “Performances” looks at the same topics as “Moment” but offers a little more depth. Not a lot more, though, so it remains pretty superficial. Still, it throws out a few interesting thoughts about the actors in between the fluff. The disc opens with ads for Gravity, The Hobbit: The Desolation of Smaug and Her. No trailer for Prisoners shows up here. 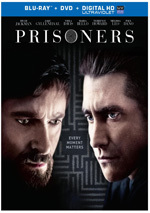 A second disc provides a DVD copy of Prisoners. It includes the same featurettes that appear on the Blu-ray. Though not without some merits, Prisoners falls flat in the end. It squanders a good cast and some intriguing elements to turn into a muddled cop thriller without the intelligence and cleverness to succeed. The Blu-ray delivers very good picture and audio but lacks substantial bonus materials. I wanted to like Prisoners but came away disappointed.